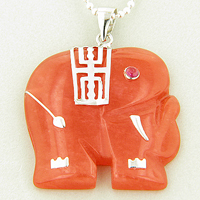 This Silver Pendant is made as Very Cute RED JADE ELEPHANT Charm with Faceted Red Cubic Zirconium gemstone as an Eye. Elephant Symbol is Really Old and Popular across the World, and used to Bring Good Luck Powers to its immediate owner. ELEPHANT Symbol of Wisdom, Luck, Loyalty.